Why buy Superworms from Fiddle Creek Farms? Overnight Shipping - All orders shipped overnight to assure the delivery of your superworms in optimum condition. *Overnight Shipping $23.95 Flat Rate (500-1000ct box) + $6.00 each additional box. Please select 'Live Insects/Worms Only (Overnight)' shipping method at checkout. 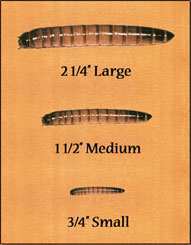 Fiddle Creek Farms Superworms are tropical insects that require warmer temperatures than standard/giant mealworms. Superworms' ideal temperature range is 70°- 80° F. Cupped superworms can be stored in the cups for up to two weeks. Bulk superworms will be shipped in a box with egg crate. Store your superworms in a plastic container between two layers of mealworm bedding (2" on bottom and 1/2" on top). Good container guidelines for a superworm container include dimensions about twice that of a shoebox, at least six inches tall, without a lid, and of sturdy plastic construction. (Small cat pans usually work well.) Add a small amount of Easy Water every other day to provide moisture for the worms. Depending on the quantity of superworms, fresh bedding should be added every week to two weeks to maintain the 2 ½" layers. Plan on completely replacing the bedding every three to four weeks.